This product is available as a download to the following member(s): "PREMIUM". Download this product by becoming a member today and also get access to over "15,594+" PLR products. You’re starting a YouTube channel? Good! But before you start framing shots with your hands and getting a beret with the word DIRECTOR, there are some points that should be considered. 1. Why? What is your motivation? Not that you shouldn’t do it, but if you can identify why you want to do it, it will change the way you do it. For example, are you using the channel to drive traffic to your personal website? Do you want to make a political or environmental or social statement? Are you pas-sionate about a hobby/profession and want to share your expertise? If the answer is “making money,” then you’re probably not on the right track. This takes time and effort. Find out what your motivation is and how that will af-fect your channel. 2. What are your videos going to cover? What will they be about? Do you have a clear idea what you want to accomplish? Be sure you’re passionate about the topic; you’re going to spend a lot of time on it. 3. Who are you making this for? Seriously. What’s your target audience? Are you making videos for the same people that love the Terminator movies? If so, they’re probably not the audience that is going to line up for Jane Austin. What will you say to your audience and how will you say it? The chances are that 14-15-year-old boys are not going to be receptive to an in-depth analysis of Mozart, and 70-year-old intellectuals are not going to want to know how to do a kick on a skateboard. It’s not just the topic. It’s a different language, a different tone, and a different ap-proach. 4. Who are you competing with? Attention spans are short things. If a viewer lasts 10-15 minutes on your channel, consider that a major victory. There are a lot of channels out there, and they are trying to appeal to the same audience you are. What are they doing? What’s their approach? Don’t give up, if it’s being done, that only means there’s a market for it. You just need to do it better, deeper or stronger or some way to set yourself apart from the others. 5. How are you going to measure your success? It's easy to say, "I'll know it when it happens," but then you'll never know if you're close. Were you closer before you changed something? After? If you can measure it, you can change direction to get closer to it. Figure out how you personally measure success. These are just somethings to keep in mind when designing your YouTube channel. Deciding these will help you figure out how to create, maintain and improve your channel, and keep the viewers coming back for more. 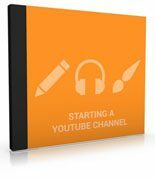 Starting a YouTube channel is quick and easy and will do wonders for your online presence. It can tie into your Facebook or Twitter or Reddit or other social media and provide ad revenue to boot. Well, there are some things to keep in mind before you start. 1. Who are you talking to? If your goal is to talk about investment strategies, you’re probably not going to target 14-year-olds. On the other hand, very few investment bankers really care about skateboards. Decide who your audience is, what they need, what they want to see and how they want it presented. Start with who you think you are in terms of audience, your age group, your in-terests, and your hobbies. 2. Who is your competition? You have competitors. No matter how unique you believe your product might be, there is someone out there with something very similar. Now pay attention to what they are doing, what works, what doesn’t and find a way to set yourself apart. Use that information to do your channel differently, either in content or style, something that sets you apart from the pack. 3. Get some content in the back. Create three or four videos and have them up-loaded. Creating and uploading are pretty straightforward, there are numer-ous instructional videos on how to get it done. Why? You’re going to want first-time viewers to have a few videos to look at in order for them to get a pattern and be enticed to return for more. 4. Be consistent. Most initial channels attract viewers only to lose them again be-cause the videos are being randomly updated or not updated at all. If there is a new video every Friday, viewers will return every Friday. If there’s a new video every other Thursday, they’ll come by twice a month. But if it’s random and skips a week now and then, they’ll be frustrated and give up. Once you’ve made a schedule, stick with it. Make sure it’s there when expected. 5. Have a backlog of videos for people to watch. If viewers like your style, they’ll want more. Give them plenty of options for more content. 6. Check the SEO. Search Engine Optimization. Use the right keywords to be found in a search. Make sure the title of each video clearly explains what the video is about. Make sure the description is clear. Keep these things in mind, and you’re on your way to a successful YouTube chan-nel. Got Your Channel Set Up? Now What? So you’ve got your YouTube channel set up. You’ve even picked out your topic and figured out how to stand out from the crowd. You’re ready to roll. Now what? Here are a few items to check off the list to keep the momentum going. Make a commitment. Don’t keep your viewers waiting. With today’s short atten-tion spans, you want new content there rapidly. Upload at a minimum once per week. If your subscribers know you’re going to post every Sunday, they will wait and check in every Sunday. If there’s nothing new there, they’ll forget about your channel. Post multiple times per week if you can but create a schedule and stick to it. Get a video flow you can live with. You’re not producing a mega-blockbuster-epic movie. On the other hand, you’re not going to create a jerky, cheesy hand-held nightmare either. You know your budget; you know how much time you can put into this. Create a workflow that falls somewhere in between cheap and pomp-ous. Give ‘em the hook. For example, if you’re going to show someone how to create an ice sculpture with a chainsaw, start with showing them the end result. Let’s see the angel first, then bring out the block of ice and the chainsaw. If that’s not appropriate, start with a story. People will sit and wait for a good story, and if there’s a story behind the video, it’ll enhance the viewing. Pay attention to the credits. You’ve seen the credits and opening music. It’s the part that people try to fast forward through. Everyone on the team deserved recognition for their hard work but keep the credits as short and sweet as you can. And about those end credits, use them to point your viewers to your website, to your product, or to your playlist with other videos in your channel. Use that end time to further your goal. Ahhhh is distracting. So is “uhmm….” Edit them out. Especially long pauses and forgotten lines. Stay focused, showing your subscribers how to bake a pie doesn’t include a ten-minute session remembering how your mother organized her kitchen. Get the tangents out too. Get good thumbnails. It increases your rating with YouTube if your thumbnails get chosen a lot. Make them compelling and easy to see. And always, remember to have fun with what you're doing. If you have fun, your viewers will have fun with you. Keep the effort in it and enjoy what you do.